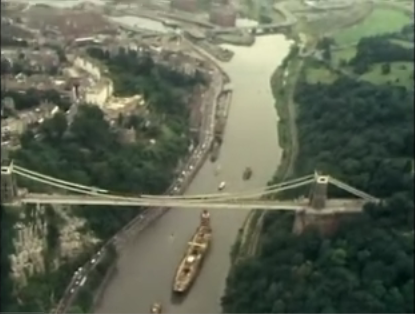 Forty years ago today, the SS Great Britain, a unique and extraordinary ship, built by Isambard Kingdom Brunel, sailed under the Clifton Suspension Bridge back into the floating harbour of Bristol. She was home from her travels after a hundred and twenty-seven years and a journey of eight thousand miles from the Falkland Islands where she had been scuppered in 1937. Here is a brand new animated film of that journey. She is now fully restored and at home in the dry dock where she was originally built. 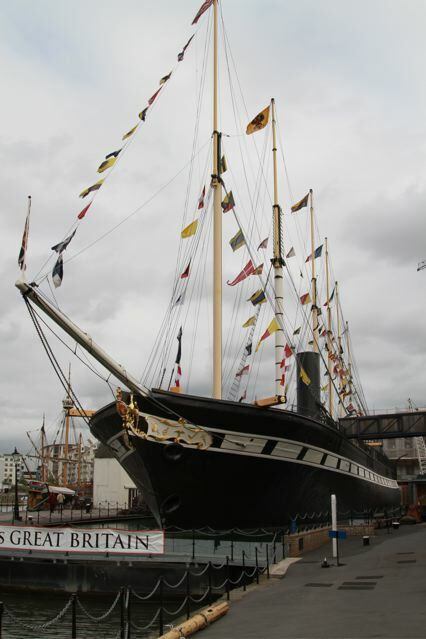 The SS Great Britain was a prototype, the first iron ship; she had a screw propellor, an iron hull and was powered by steam from a massive engine as well as having a full complement of sail. She travelled thirty two times round the globe during her working life, sailing nearly a million miles in all. A large part of her working life was spent taking emigrants to Australia and she also carried troops to the Crimea. There were ovens on board naval vessels before the 1860, HMS Victory was fitted with a range that held two large pots for boiling stew, two ovens for baking bread and an open grate for grilling and spit roasting. Officers had a wardroom assistant that would act as officer’s cook while the majority of the crew were catered for by the ship’s cook (the old nickname was the cook was “Slushy” which reflects the meals that were often served). Usually they would bake sea biscuit rather than bread with yeast, but there are references to toast that implies some fresh bread had been available. Depending on the skill of the cook, where the ship was posted and how long for would affect supplies but some sort of sourdough was the most likely option. I’m not sure that the breads in the display on board ship would really all have been made there, but knowing the ingenuity of modern artisan bakers with their sourdoughs, anything is possible! In the process of trying to find out what bakers in the 1840s would have used to leaven their dough I came across this description of process at the Fort Vancouver reconstruction website which talks about ‘stock yeasts’ and a ‘ferment yeast’ made from potatoes… Have a read if you are curious. It’s all a long way from our detailed step-by-steps and videos we have now! This lovely ship is well worth a visit if you are ever in Bristol. In fact, it’s brilliant! The official site is here with loads more information. This entry was posted in Bread, Bristol and tagged Fort Vancouver, Isambard Kingdom Brunel. bread history, SS Great Britain on 19/07/2010 by Joanna. Fascinating stuff! Could you imagine the job of cooking for all those people, while on water? Celia, I can’t imagine cooking for a huge amount of people full stop. They carried livestock, cows for milk, animals for meat…no refrigeration. Must have been fun! Sally, It’s a great ship to visit, huge when you get on board, much bigger than it looks from the picture on the post. It sits in glass, so you can go right down to the hull and walk around the outside and look up at the sky. I’ll see if I can find some more of Brian’s pics and put them on a page at some point. I knew absolutely nothing about it…. loved this post! If one day I have the chance to head in your direction in the world, I’ll visit this ship for sure. This is a fascinating and evocative post . I spent many years living in that other great seaport , Liverpool . I have always thought that Liverpool & Bristol share much of their seafaring history in common – not all of it good it has to said (slave trade) but much of it truly fascinating . I find it incredible to think of all of the journeys that this ship has taken – 32 times around the world – WOW !!! Incredible . If only that ship could talk !